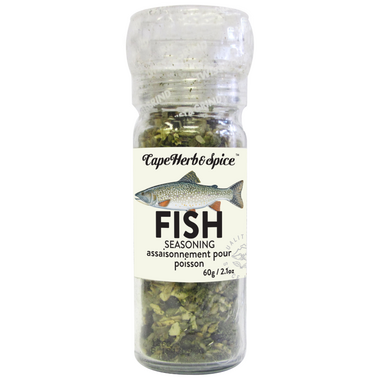 A balanced blend of fish loving herbs and spices, such as dill, lemon zest and pepper! Use to season salmon or linefish fillets before grilling with butter. Stirfry with prawns or calamari. What a wonderful product! We try to eat salmon once a week and up to finding this product, dinner was just ho-hum. I decided to give it a try and was blown away by the complexity of the flavours! I always have 2 spare in the spice cupboard. When the second last one is opened, I order two more. I hope Well doesn't stop carrying this great spice! Excellent spice that spices up any fish very well. Wonderful spice for fish. Takes it to another level.